Okayama has plenty of fantastic tourist attractions. Let us introduce the best places to see in the prefecture. The Makido cave is located in Niimi, Okayama Prefecture. This limestone cave is 450 meters long and contains an underground lake. The name Makido means “full of mystery”, and the cave indeed looks mysterious with its numerous stalactites and the lighting that creates a spectacular effect. The Okayama Korakuen Garden is one of the Three Great Gardens of Japan, and it has received three stars in the Michelin Green Guide Japon. This beautiful cultural heritage site is a must-see place and probably the most famous site in Okayama. The Shurakuen Garden is a typical example of an Edo period traditional garden, which includes a path surrounding a pond. This garden is 50 years older than the Okayama Korakuen Garden, and it is very calm and soothing: you’ll certainly be able to feel the historical atmosphere. The Raikyu-ji temple, which full name is Tenchu-zan Ankoku Raikyu-ji, was built in 1339 AD by the shogun Ashikawa Takauji. It is designated as a National Site of Scenic Beauty by the Japanese government, and it is famous for its garden. It is said that this is where the Japanese dry landscape garden style originated. The Kurashiki River used to be crowded as it was used to transport cargo. 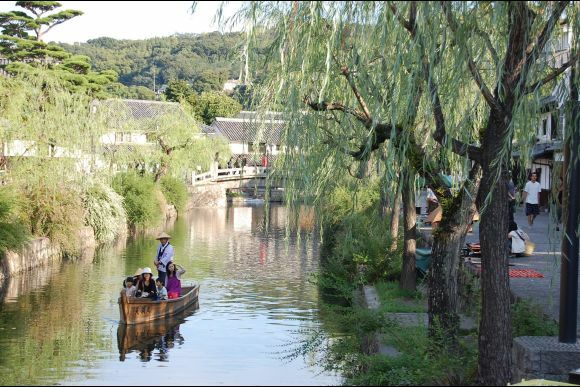 Kurashiki River Boat Riding is an attraction that makes you feel like you went back in time. From the boat you can enjoy the beautiful landscape of the Kurashiki Historical District as well as learn about the history of the area. This charming street used to be a merchants’ and artisans’ area. Historical townhouses are aligned on the street, making it a charming place to have a walk. Cafes, restaurants, stores and inns can be found inside the renovated townhouses. The Bitchu Matsuyama Castle in Takahashi City is a superb spot known as the castle with the highest elevation above sea level in Japan. It is said that if the weather allows it, visitors can see a sea of clouds surrounding the castle. Ukita Hideie, one of the five chief ministers of the Toyotomi Family, built the Okayama Castle. The castle tower, which used to be a national treasure, was burnt down during the war, so the current tower is a restored version. It is possible to visit inside the castle, and to enjoy a beautiful view from the sixth floor. Kibitsu shrine is a shinto shrine registered as a national treasure. The 400m covered path connecting Kibitsu Shrine to the main shrine is a must-see. The charming town of Fukiya is famous for its buildings’ stone roof tiles colored with Bengara, a reddish pigment made with iron oxide. Thanks to the production of Bengara, Fukiya became prosperous from the end of Edo era through the Meiji Restoration, and is now recognized as an important cultural heritage. Okayama is a prefecture full of attractions where you can experience Japanese history. It is definitely an area not to be missed!